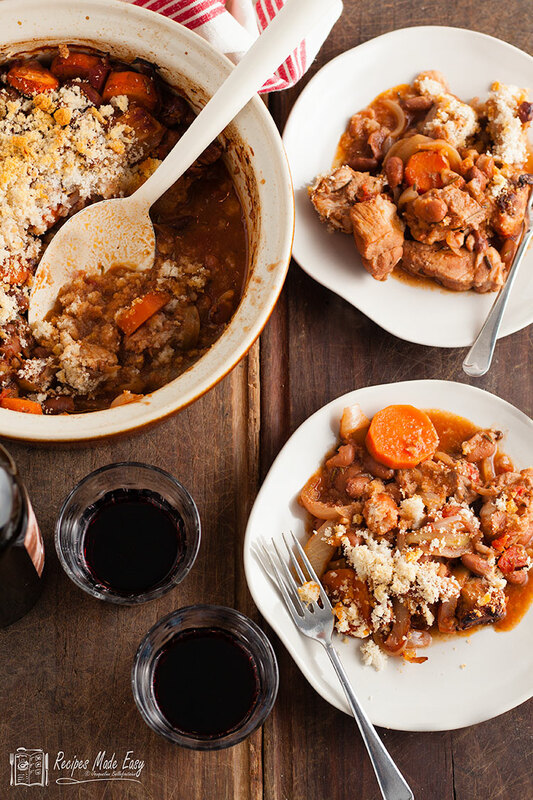 Rich, warming and filling – this easy pork cassoulet is a delicious casserole for cooler days. 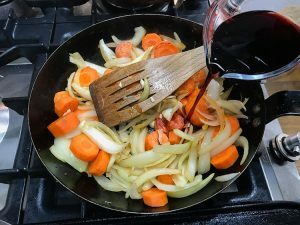 Topped with crispy breadcrumbs it is a nutritious stew that is tasty enough to serve to guests as a dinner party dish and yet economical enough for everyday dining. 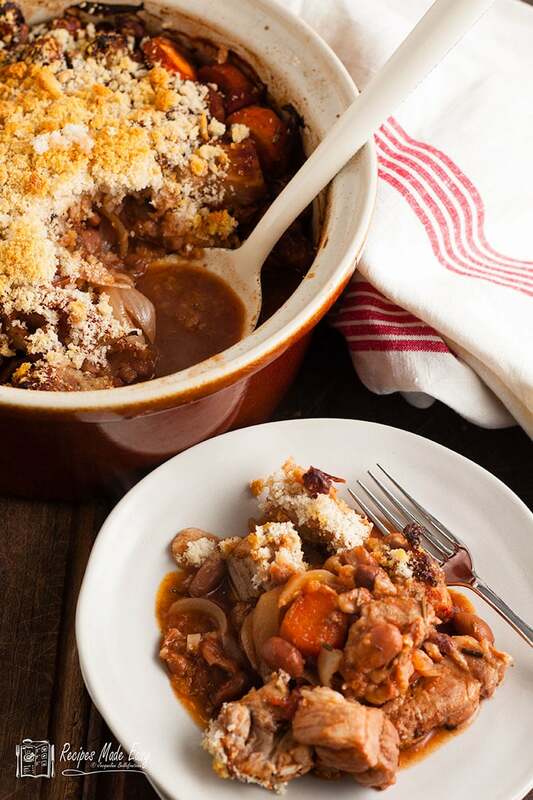 Cassoulet is a rich, slow-cooked casserole containing meat and beans. The dish originated in the south of France and is named after its traditional cooking vessel, a deep, round, earthenware casserole pot. 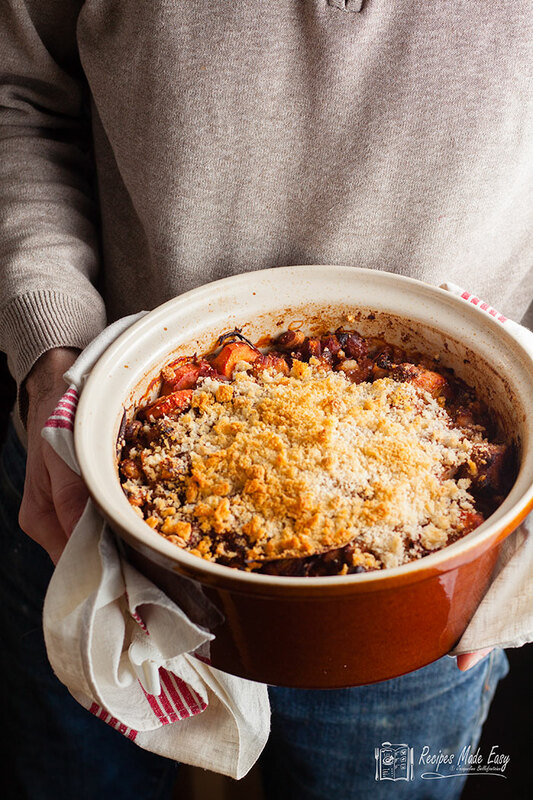 In certain regions of France, they take cassoulet very seriously and even have organisations dedicated to the cooking and judging of the best cassoulet. 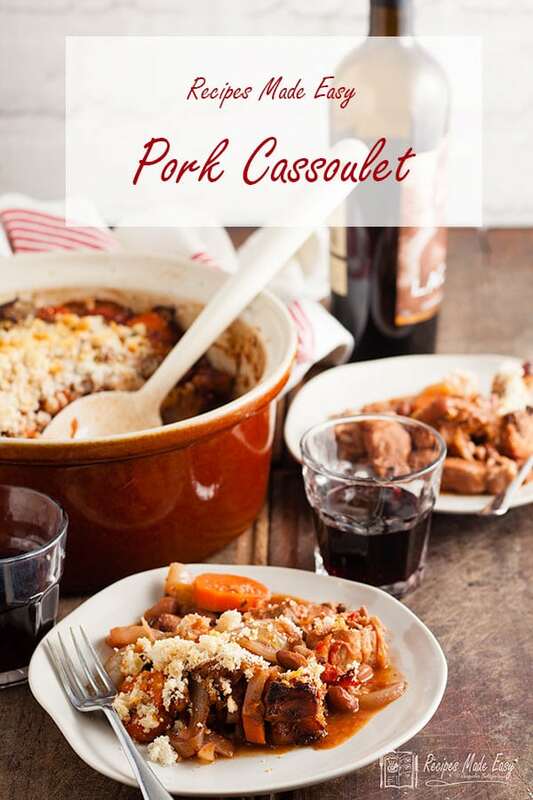 If you are a purist this variation is not for you, although the cassoulet will vary from region to region in France, so even the French may argue what is or isn’t authentic. I have taken cassoulet in its general term, to mean a meat and bean stew. If you like good home cooking packed full of flavour then you will love this dish. I think pork shoulder is the best cut of pork for this. 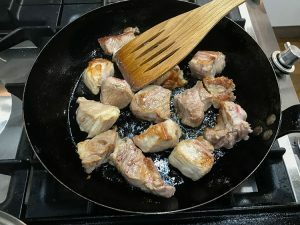 It is cheaper than pork legand has just the right amount of fat to add flavour and richness to the stew. Pork leg can tend to be a little dry and tough even in a casserole. Beans bulk out the dish which makes it very satisfying and filling. Traditionally white beans, usually haricot beans, known as navy beans in the US, are used, but I have used borlotti beans. 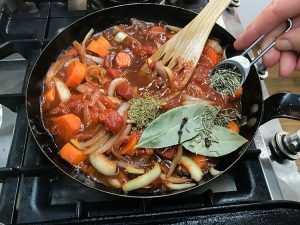 Partly because they are one of my favourite beans but if I’m honest it is because that is what I had in the cupboard when I made this recipe for the blog. I did originally plan to use haricot beans but using the borlotti beans was very successful, but feel free to chop and change the variety of beans to suit. You could even use red kidney beans if you liked or a mixture of the two. Although I personally prefer borlotti as they are softer than kidney beans. 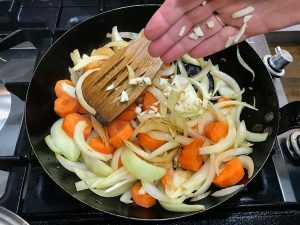 As well as carrots you could add turnip, swede or parsnip if you liked and if you have a couple of sticks of celery you could add them with the onions. One of the many things I like about cassoulet is it really is a meal in one and doesn’t need anything else to go with it. I do sometimes serve some kind of leafy green vegetable with it because I feel I should eat my greens! 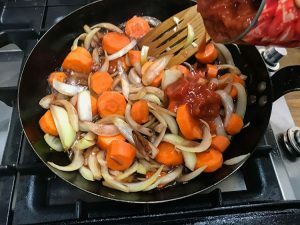 You certainly don’t need potatoes or rice or any other white carbs with it although I have been known to eat it with a bit of crusty bread – just for mopping up the last of the delicious juices. 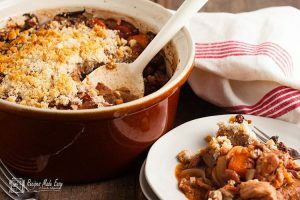 An easy to prepare hearty pork and bean casserole with a crisp breadcrumb topping. Preheat the oven to 180℃ (160℃ fan)/350°F/gas mark 4. Heat 1 tbsp of the oil in a non-stick frying pan and fry the pork in 2 or 3 batches until browned on both sides. Transfer to a large deep casserole dish. Add the onion and carrot and sauté for 4 to 5 minutes until just softened adding a little extra oil if required. Add the garlic and continue to cook for 1 minute. Add the wine and bring to the boil and simmer for 1 to 2 minutes, then add the tomatoes and herbs and cloves. Return to the boil and season with salt and pepper. Pour into the casserole then add the beans and stir together to combine. Sprinkle the breadcrumbs on top and bake for about 1 hour until the meat is tender and the breadcrumbs topping is crisp. 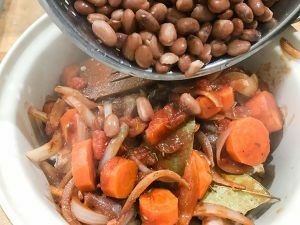 Using canned beans is very convenient but if you use beans a lot, you will find it more economical to use dried beans. These can be soaked and cooked in advance and frozen in usable portions. I cook mine in a pressure cooker. Cook the onions and carrots until beginning to soften then add the garlic. Stir in the red wine and allow to bubble for a few minutes. Add the herbs, cloves and seasoning, bring to the boil. 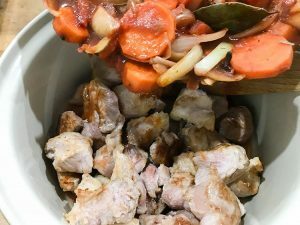 Pour over the pork in the casserole dish. Add the beans and stir to combine. 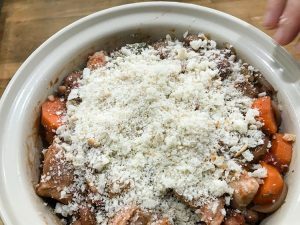 Sprinkle the breadcrumbs on top of the cassoulet. Why not subscribe to Recipes Made Easy for my weekly newsletter. Or follow me on Instagram, Twitter and Facebook. Ooh this looks tasty! I love a one pot dish and especially one that involved pork. Your Cassoulet looks gorgeous Jacqui. I could demolish this with a big pile of purple sprouting broccoli on the side right now!